Harry Potter And The Order Of The Phoenix has never been my favourite Potter film, mainly because the creation of The Order itself feels like something kids do to pass the time at a Butlin's Summer camp. Secret rooms, hiding from the adults, the snitchy kids trying to find out what you're up to; it all feels a bit innocent for the franchise, particularly given just how dark Goblet Of Fire went. Rewatching it, as part of the Blu-ray box set Warner put out, confirms this to be the case but, with the knowledge that The Room Of Requirements' Secret Holiday Club is to come, there's some great work to enjoy in other parts of the film. Imelda Staunton is deliciously horrid as Dolores Umbridge, the character who finally personifies the franchise's pre-occupation with the problems when state or church mix with institutions such as schools. She pitches Umbridge as a nasty version of Hyacinth Bucket, Patricia Routledge's amazing creation in the BBC sitcom, Keeping Up Appearances. Like Bucket, Umbridge has the lace doilies and the prim appearance but the humour is replaced with a vindictiveness that permeates the film and provides great opposition for Potter and co.
With Umbridge terrorising the students then, there's a lot to like in the middle third but the final third starts to throw up a few problems. In later films, invading The Ministry seems about as difficult as breaking into Fort Knox. Here, the characters simply walk in. Before this, they jump on a collection of Thestrals to make their way there but according to the rules the film laid out surrounding the creatures, around ninety percent of the characters on show shouldn't be able to see the creatures, let alone ride them. You start to feel the whole thing getting a bit sloppy, as it races towards its admittedly satisfying conclusion. There is enough there to keep your interest though. 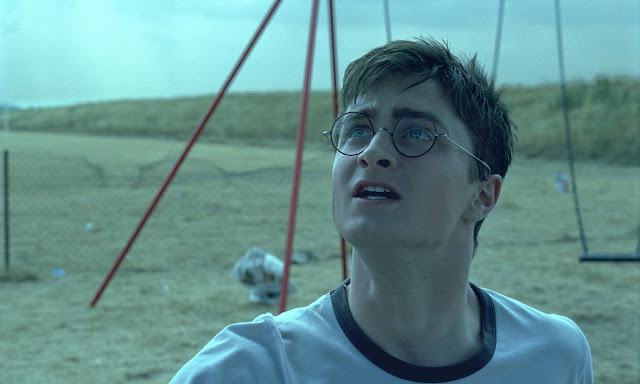 The huge familial overtones (Sirius (Gary Oldman) suggests, probably for the first time, that Harry might have a warm family unit to go when 'this is all over') are developed well and played on to the right degree and the action seems to step up a notch, particularly in the genuinely scary confrontation amongst the walls of balls towards the end. There's a little too much tweeness though, odd in a film that takes tweeness (Umbridge) and makes it malevolent. Count the amount of rounds of applause in the film, for example. I told you, at times it's like being in a holiday camp.